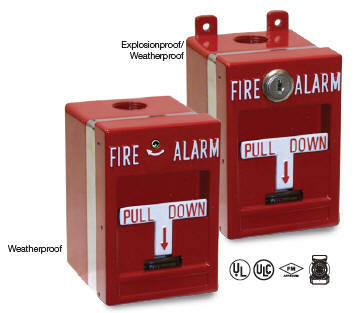 MPSR Series manual pull stations from Edwards are noncoded fire alarm stations solidly constructed of die-cast material. All components are pre-painted or have plated surfaces to inhibit corrosion. Weatherproof manual stations are rated for outdoor use. Single- and double-action MPSR models are available with either single pole (normally open) or double pole (double throw) alarm contacts. Depending on the model, access to the unit for resetting purposes is gained with either a keylock or hex screw. 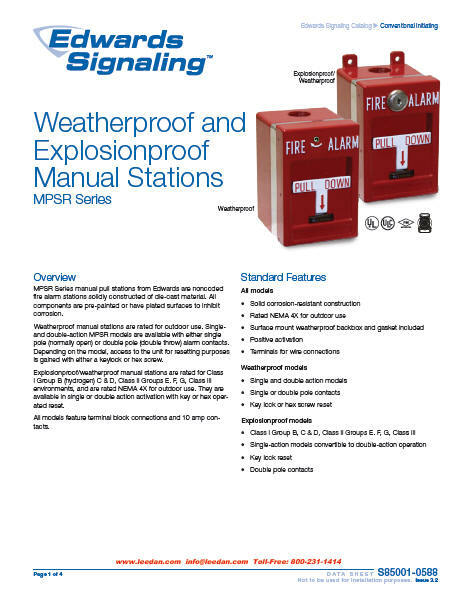 Explosionproof/weatherproof manual stations are rated for Class I Group B (hydrogen) C & D, Class II Groups E. F, G, Class III environments, and are rated NEMA 4X for outdoor use. They are available in single or double action activation with key or hex operated reset. All models feature terminal block connections and 10 amp contacts.